Elizabeth A. Croft, Ph.D., P.Eng., Fellow Engineers Canada, Fellow American Society of Mechanical Engineers, is a Professor of Mechanical Engineering and Associate Dean, Education and Professional Development for the Faculty of Applied Science at UBC. She holds the NSERC Chair for Women in Science and Engineering, BC/Yukon at UBC and leads the Westcoast Women in Engineering, Science, and Technology (WWEST) program. Elizabeth founded WWEST in order to attract, recruit, and retain women in engineering and science careers. WWEST works at national, regional, and local levels with organizations engaged in increasing the number of women in science, engineering, and technology (SET) disciplines through multilateral partnerships spanning community, academic, and private sector partners. WWEST serves as the premier hub for activity and dialogue about meaningful inclusion and increased participation of women in SET disciplines on Canada’s west coast. Elizabeth also serves as Principal Investigator for the National NSERC Chairs for Women in Science and Engineering Network and for the SSHRC partnership development project “Engendering Engineering Success” aimed at increasing the participation and retention of women in engineering careers. As Director of the Collaborative Advanced Robotics and Intelligent Systems (CARIS) Laboratory at UBC, Elizabeth’s research investigates how robotic systems can behave, and be perceived to behave, in a safe, predictable, and helpful manner, and how people interact with and understand robotic systems. Applications of this work range from manufacturing assembly to healthcare and assistive technology. 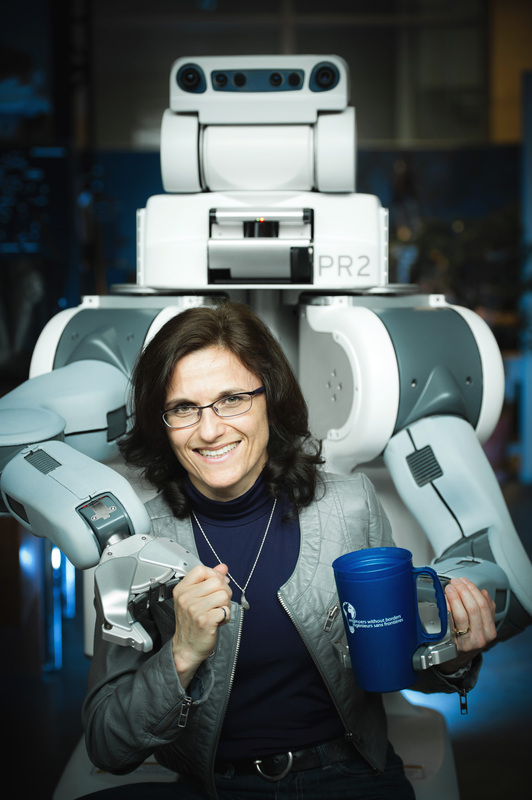 She leads a multi-institution project on robotic assistants for manufacturing (with GM Canada) and an industrial vision guided robotics project (with Hyundai Heavy Industries). Elizabeth received a B.A.Sc. in mechanical engineering in 1988 from the University of British Columbia,a M.A.Sc. from the University of Waterloo in 1992 and a Ph.D. from the University of Toronto in 1995. She worked in motor vehicle dynamics consulting from 1988 to 1990. In 1995, she joined the Department of Mechanical Engineering at UBC as the BC Packers Junior Chair of Industrial Automation. Elizabeth received a Peter Wall Early Career Scholar award in 2001, the Association of Professional Engineers and Geoscientists (BC) Professional Service Award in 2005, the Award for the Support of Women in the Engineering Profession, Canadian Council of Professional Engineers in 2006, an NSERC Accelerator award in 2007, and a YWCA Women of Distinction Award in 2013. She was a founding instructor of the MECH2 program, which won the 2005 ASME Curriculum development award, the 2007 UBC Alfred Scow award and the 2008 Alan Blizzard Award. Elizabeth has been a member of the Division for Advancement of Women in Engineering and Geoscience of the Association of Professional Engineers since 1995. She has served in many positions with this group including Co-Chair (98/99) and is currently on the Advisory Board. She was Co-Chair of the 1998 CCWEST Conference in Vancouver. Elizabeth has given numerous talks and educational sessions to promote women in engineering from elementary school through graduate studies, academe and industry careers. She is the founding Faculty Advisor for the UBC Engineering Tri-mentoring program, the UBC Women in Engineering group, and recently launched the Global Engineering Leadership course series at UBC. Elizabeth is also a member of SCWIST and IEEE. Elizabeth is a “soccer mom” for her 3 daughters and is married to a wonderful engineer and musician. She enjoys running, gardening and quiet beaches.